An example of what an UrtheCast video would look like. UrtheCast is a startup that plans to mount high-definition cameras underneath the International Space Station, to stream slightly delayed video of the Earth from space. A near-real-time video stream of the Earth, taken from the International Space Station, is slated to go live this fall. The project will enable everything from the detailed monitoring of mass movements of people, such as refugees, to out-of-this-world marriage proposals. This will be the first time streaming video of the Earth will be available from an orbiting satellite. The upcoming stream, called UrtheCast (pronounced "Earth-cast"), will have a resolution of 1 meter (3.3 feet) and will be free, Scott Larson, UrtheCast's president, told TechNewsDaily. It will broadcast with a delay of about an hour to 90 minutes. Its resolution isn't sharp enough to pick out faces, Larson said, but there's still plenty the UrtheCast cameras will be able to see, including groups of people, buildings, trees, roads and fields. "I mean, you'll never see the guy mowing the lawn in his backyard," Larson said. "But you will be able to see a white golf cart on a green lawn." Larson's company also plans to stream lower-resolution images of the Earth starting in the first half of 2013. The Canadian company UrtheCast plans to launch high-definition video cameras like this one to the International Space Station to beam near real-time views of Earth from space. On the UrtheCast platform, people will be able to watch videos, save them and search for them, just as they do now on YouTube, Larson said. 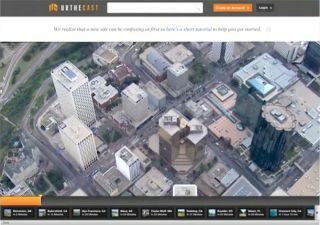 UrtheCast will end up gathering images of cities from several angles, so the Canada-based startup will be able to make 3D models of cities for people to explore. Another fun feature: Users will be able to enter in their addresses to find the next time UrtheCast will have their houses in its sights. (On average, the International Space Station passes over a given address every eight to 10 days.) Larson suggested people could gather their friends, put them all in white T-shirts, and have them stand in a green field to spell out messages, such as "WILL YOU MARRY ME?," just as the International Space Station goes by. Such services will be free, and the application programming interface will be freely available for developers to make apps using UrtheCast video and photos. To pay for the free features, Larson plans to sell still photos and videos of the Earth with the same resolution as the free products, but with additional information. National governments could buy videos of their home countries in order to monitor crops, for example. The paid product would not only show video of the crops, but also have additional data, such as the height of the wheat it sees. Governments use such data to decide whether to import or export foods, Larson explained. Governments, defense agencies and other industries spent $1.4 billion on satellite imagery in 2011, so UrtheCast will be entering a well-established market. UrtheCast is now working with engineering firms in Canada and the U.K. to build two cameras, one high-resolution and one medium-resolution. Larson expects to finish the cameras this summer. UrtheCast then plans to ship the cameras to Russia, where they'll go up into space in two separate Soyuz rockets in the fall. The Russian aerospace firm RSC Energia has agreed to install the UrtheCast cameras underneath the International Space Station and downlink the cameras' photos and videos to stations on Earth. On the ground, UrtheCast staff will process the imagery and publish it to their website. Meanwhile, the company plans to send to space a less sophisticated camera to be installed inside the International Space Station. The camera will provide streaming images of the Earth starting in the first half of 2013. The camera won't be able to show people or vehicles like its more sophisticated cousins coming in the fall, but, said Larson, it'll show "nice pictures of Earth from space." A couple groups have already started projects with UrtheCast in mind. The company has signed an agreement with the United Nations Institute for Training and Research to provide coverage of situations such as droughts and mass movements. UrtheCast is also partnering with DeforestACTION, a nonprofit that's recruiting volunteers to pore over UrtheCast videos for signs of rainforest removal in Indonesia. "I think there are all kinds of apps and games and contests and things that people will create," Larson said. "Some apps will be trivial. Others will be profound." This story was provided by TechNewsDaily, sister site to SPACE.com. You can follow TechNewsDaily staff writer Francie Diep on Twitter @franciediep. Follow TechNewsDaily on Twitter @TechNewsDaily, or on Facebook.